Emira Property Fund is selling a sizeable R1.8bn portfolio of 25 office assets to a new majority black-owned entity, specially setup for this purpose. In the real estate industry, the right location is key, which is why Deloitte Africa chose Waterfall City as the ideal location for its new Africa head office. Emira Property Fund continues to advance its conservative approach to funding, which underpins its agile approach to market opportunities. JSE listed diversified property REIT (JSE:TEX), Texton Property Fund Limited (“Texton”), is pleased to announce the appointment of James Armstrong as a Senior Asset Manager overseeing Texton’s assets in the United Kingdom (“UK”) effective 1 May 2018. JSE diversified REIT - Dipula Income Fund (Dipula) – yesterday announced the results of its successful bookbuild in which it raised approximately R790 million. 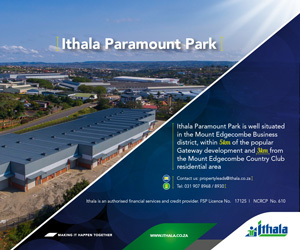 Emira Property Fund is undertaking a major R795 million redevelopment of its Knightsbridge Manor office park in Bryanston, Johannesburg, into a P-grade and leading-edge Green Star SA rated office complex. Proposed merger between Capital Propfund (Pty) Ltd and Vacant immovable property to be known as Erf 2551 Louwlardia, Extension 74 Township (Target Property). Specialist logistics property developer and landlord, Equites Property Fund Limited, announced that it has raised R1,5 billion through an accelerated book build.